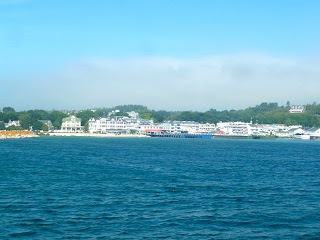 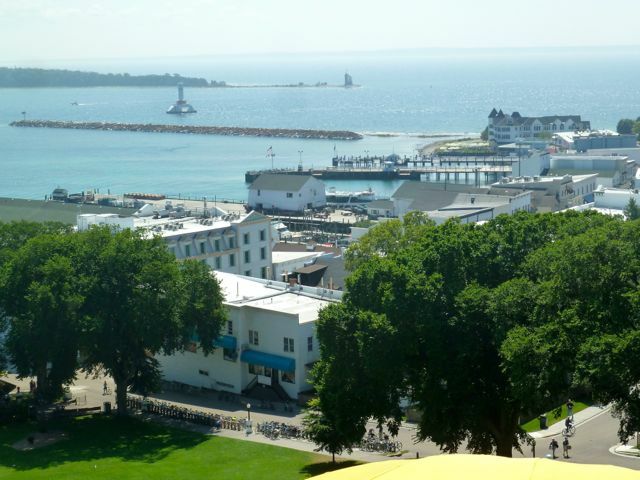 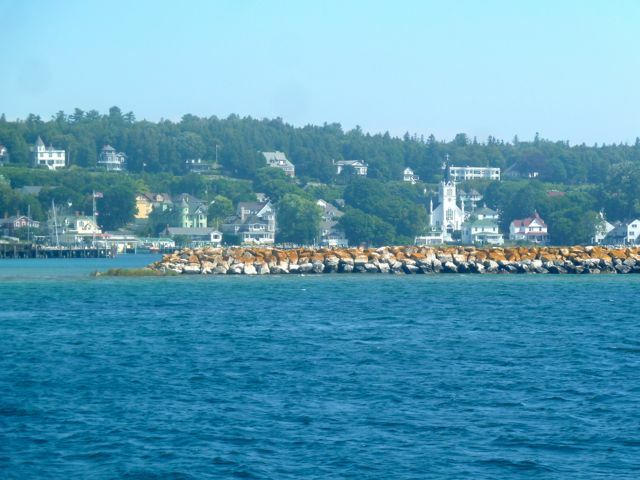 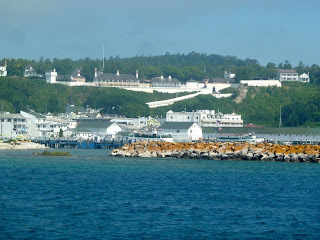 A beautiful day for touring Mackinac Island. There are three ferry services to the island and we choose Sheplers for the 20 minute ride across Lake Huron.www.sheplersferry.com The ferries leave every 30 minutes and parking is free. 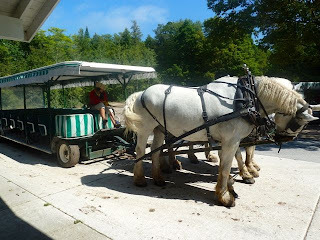 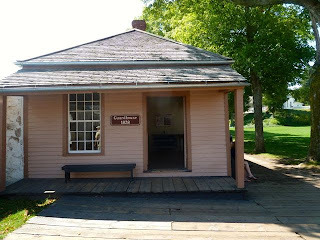 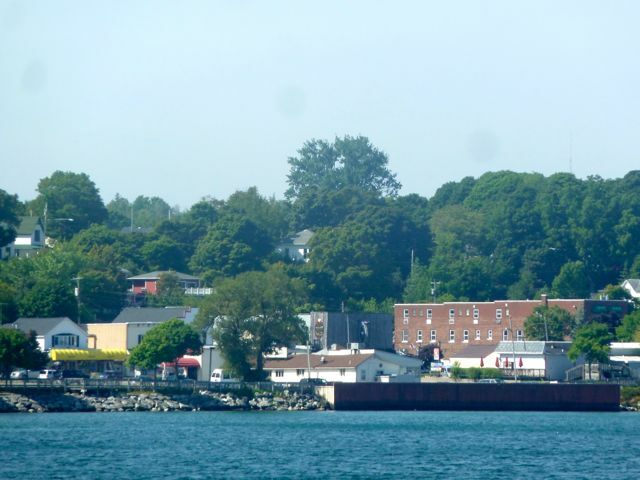 We opted for the rt ferry ticket,carriage tour and fort admission for $56.00 inc tax/ea. 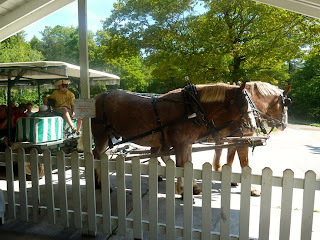 Upon arrival we walked to the Carriage Tour office for our tour. Carriagemen began providing tours in 1869. 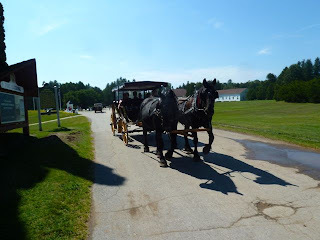 The automobile was banned in 1898 as they spooked the horses. 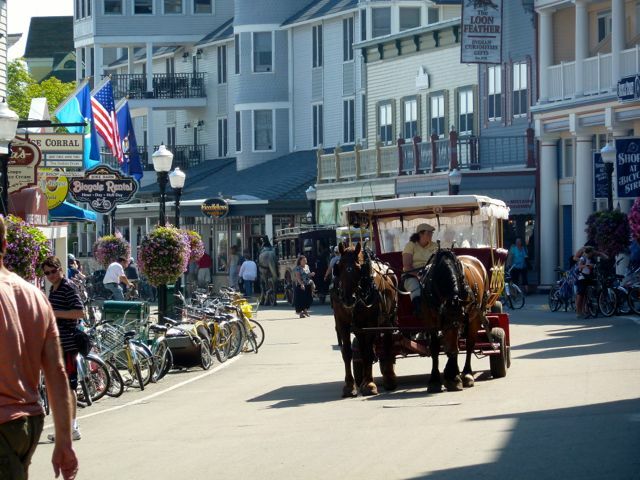 So to get around the island, you walk, bicycle or take the carriage. 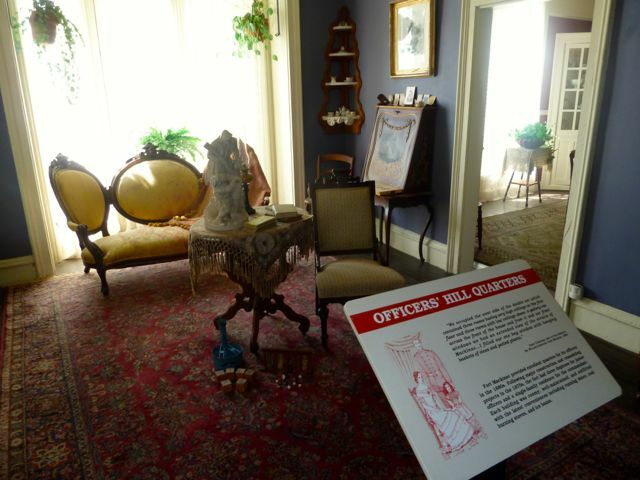 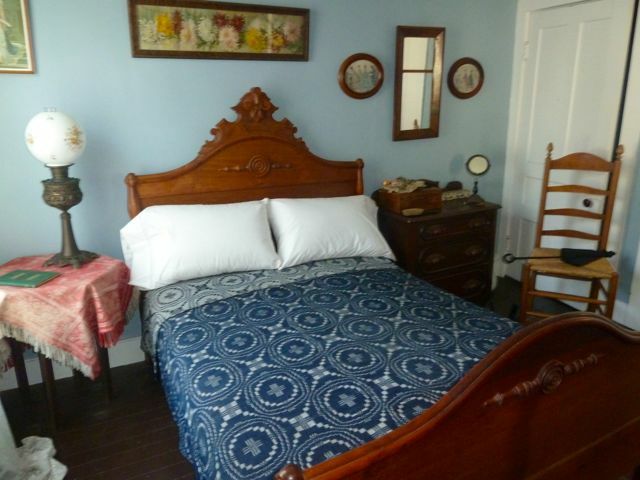 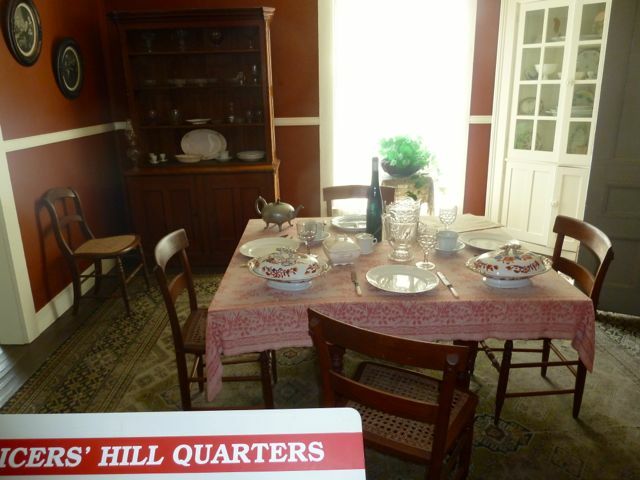 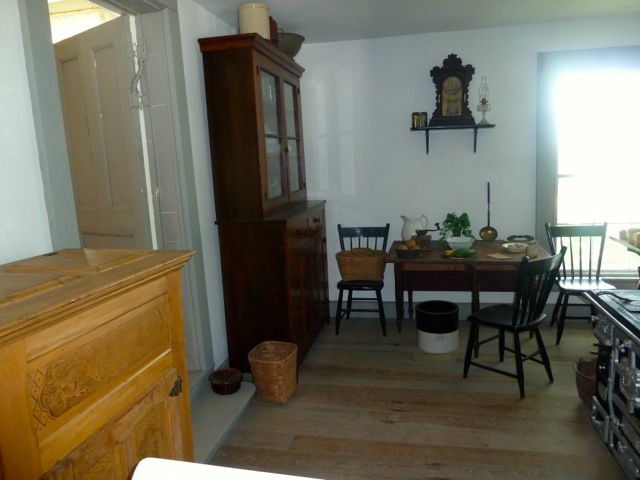 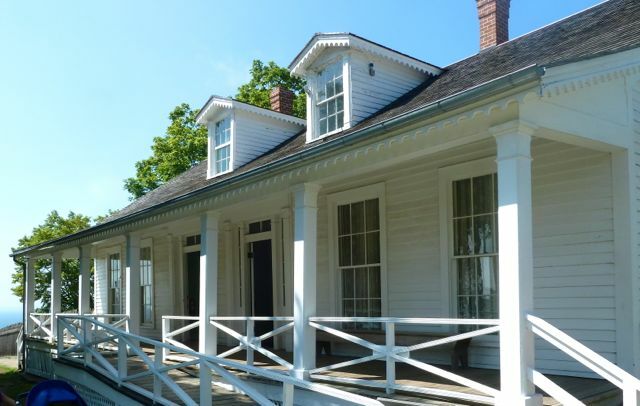 Many of the historic sites are within walking distance of downtown. 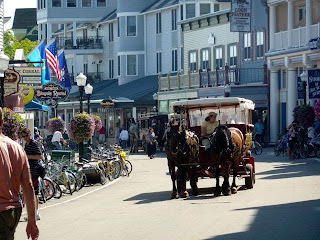 There are also many bicycle rental kiosks. You also have the option of renting a surrey or touring by horseback. 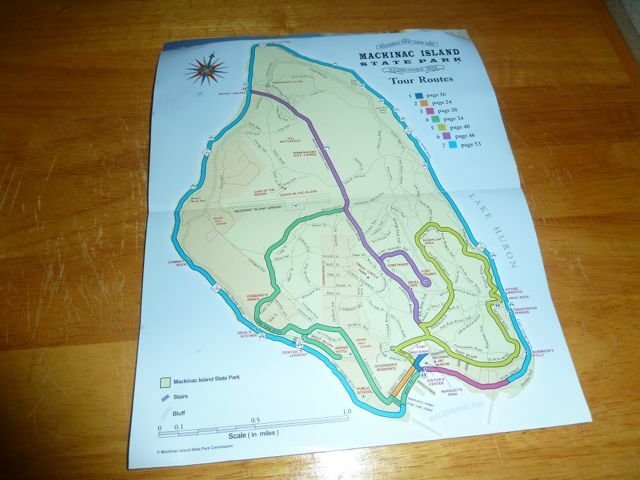 The bicycle tour around the island is 8 miles. There are also several bike tour paths through the center of the island. 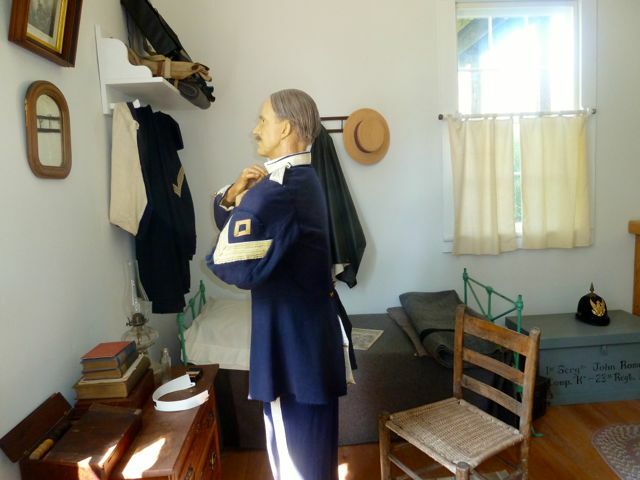 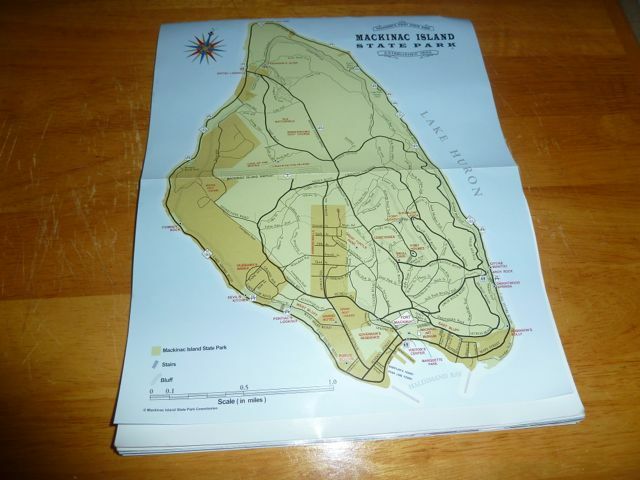 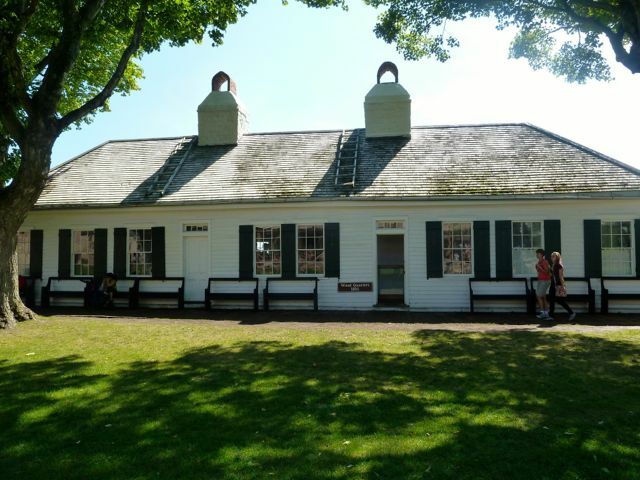 The Visitor Center can provide many ideas and rates for touring the island. 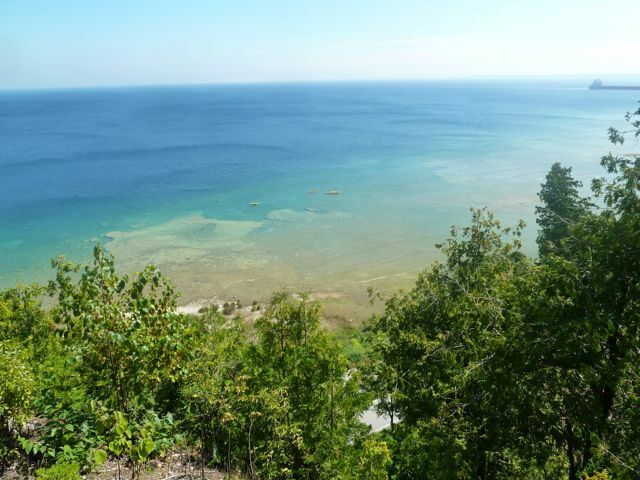 Great Lakes American Indians were the island's first inhabitants in the years 1000BC to 1650AD. 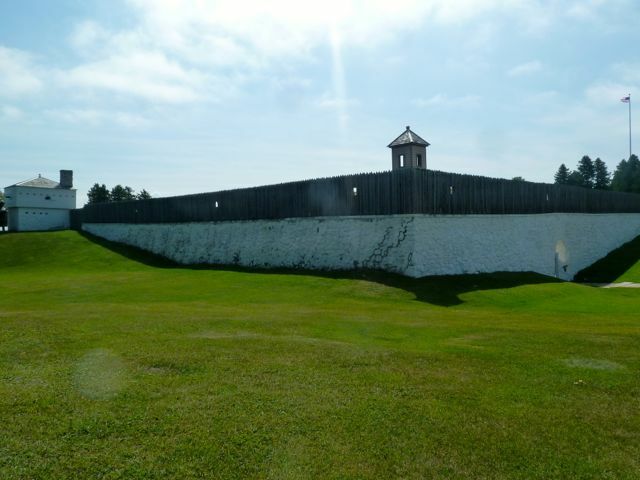 They considered this to be a sacred place. 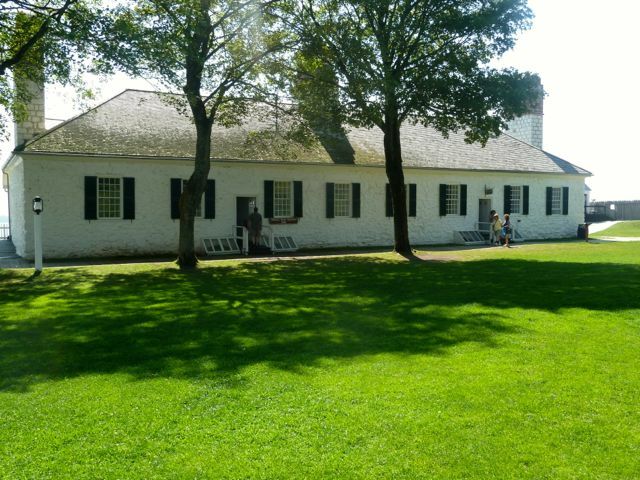 European settlements began in 1670 when Father Dablon established a Christian mission on the island. 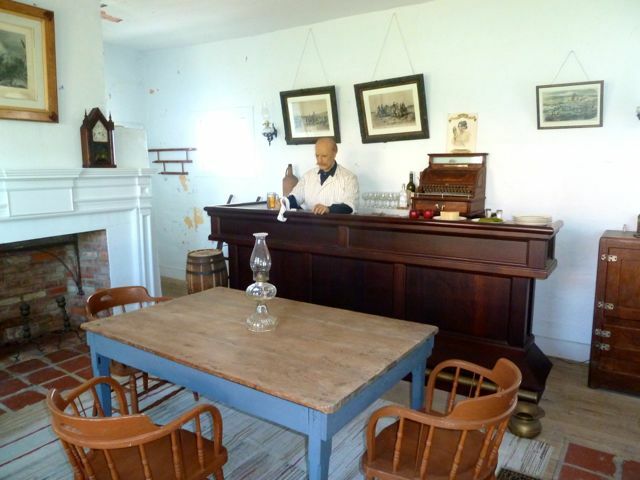 After the war of 1812, John Jacob Astor established the American Fur Company. 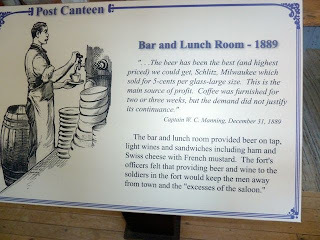 In the 1830's commercial fishing replaced the fur trade. 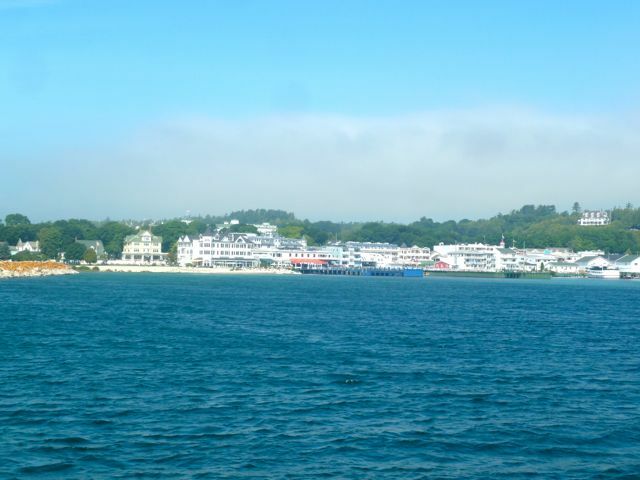 After the Civil War, the island became a very popular tourist destination. 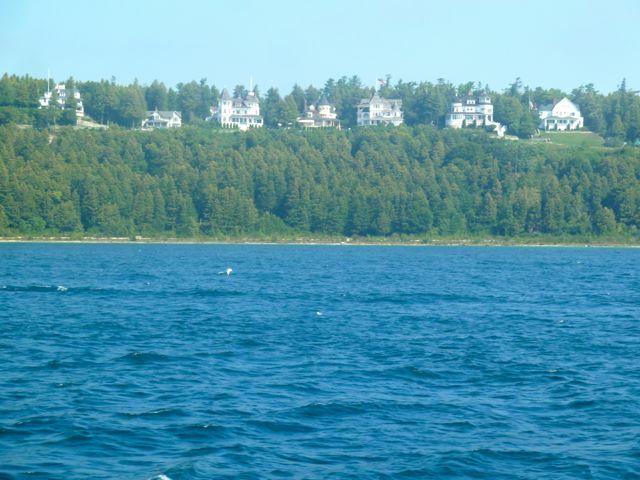 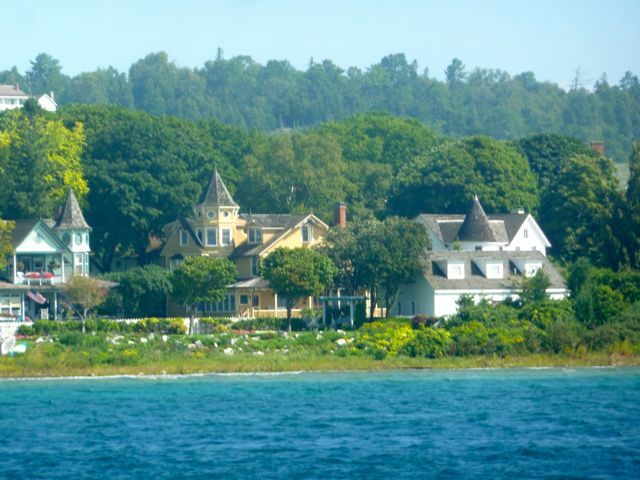 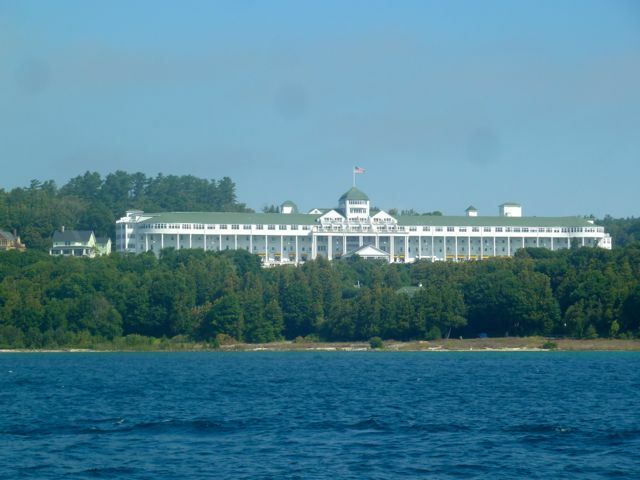 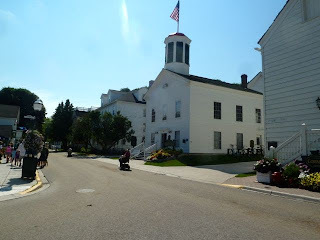 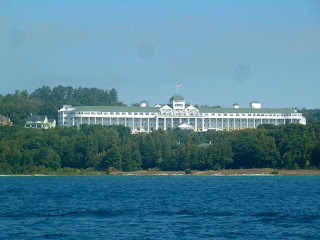 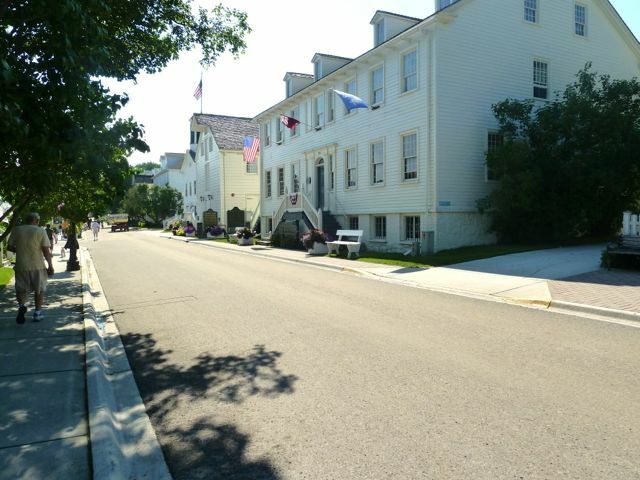 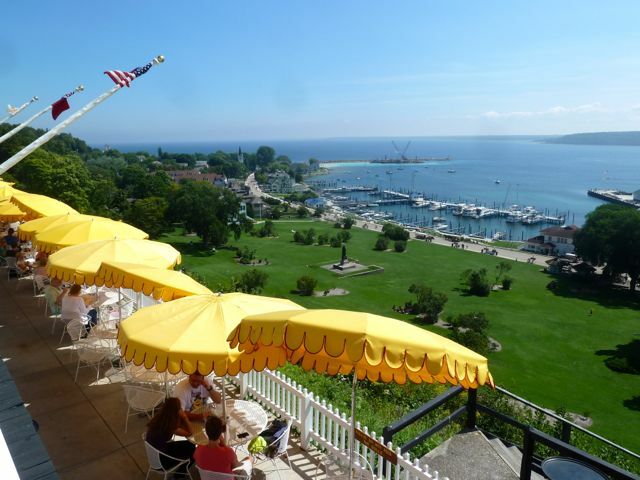 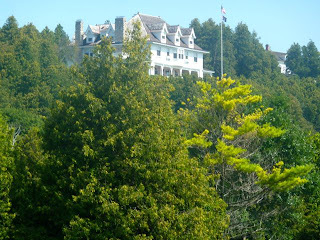 Hotels and cottages were constructed to accommodate the tourists and in 1887 the Grand Hotel received its first visitors establishng Mackinac Island as the most fashionable resort in the Great Lakes. 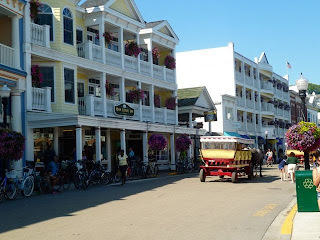 Fudge is the number one sweet souvenir and today there are over 2 dozen fudge shops on the island. 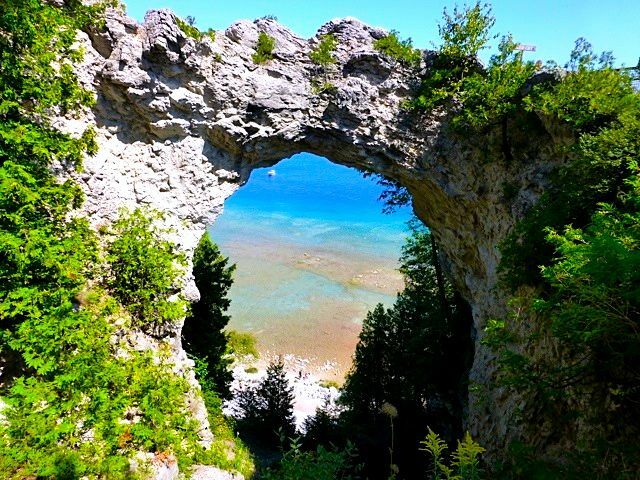 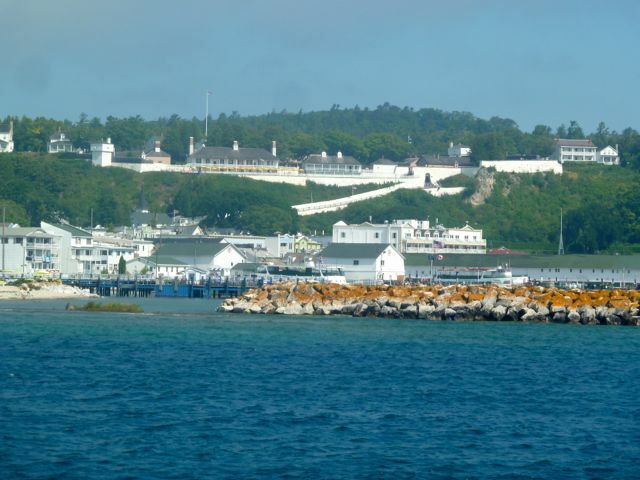 Today 80% of the island is under the protection of the Mackinac State Park. 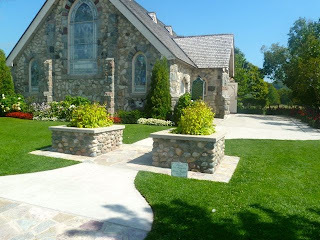 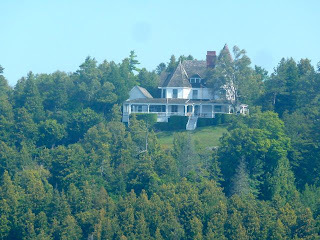 The movie "Somewhere in Time" was filmed here in 1979 and in 1946 the movie "This Time for Keeps". 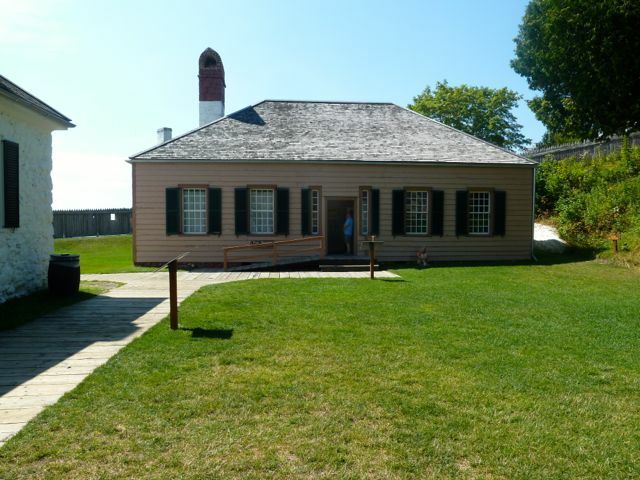 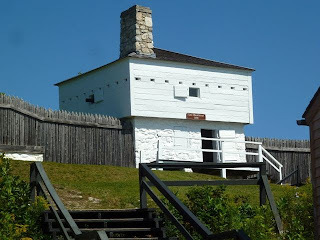 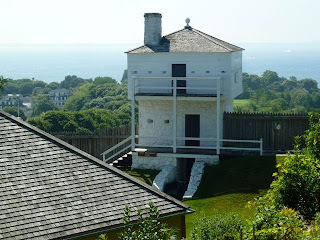 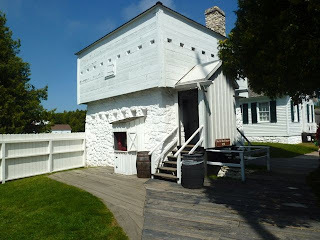 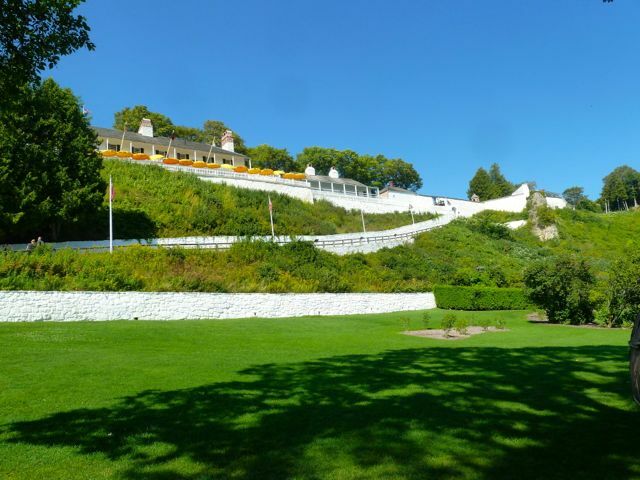 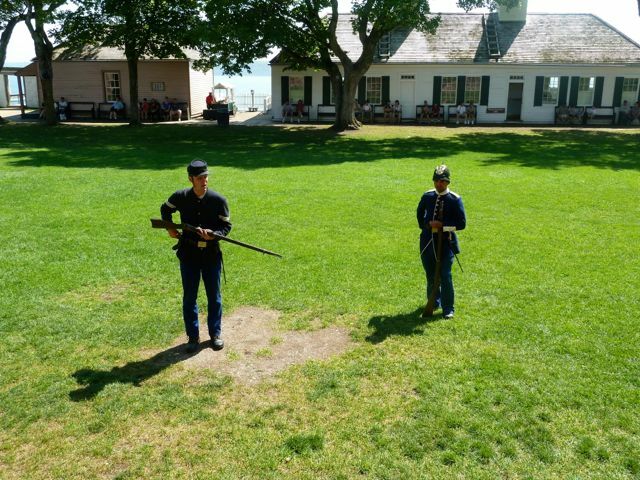 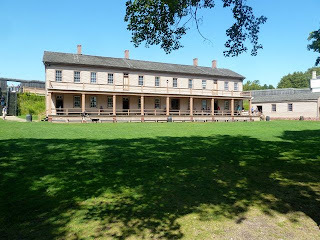 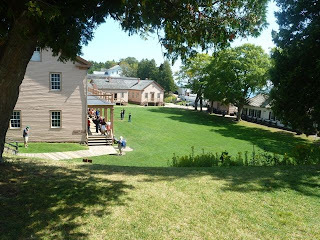 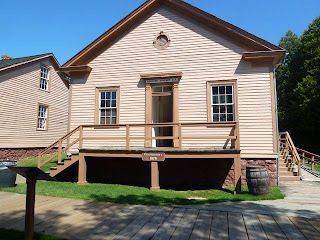 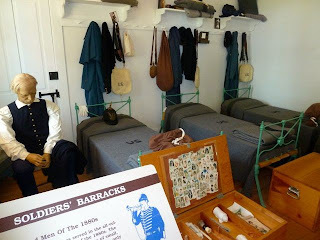 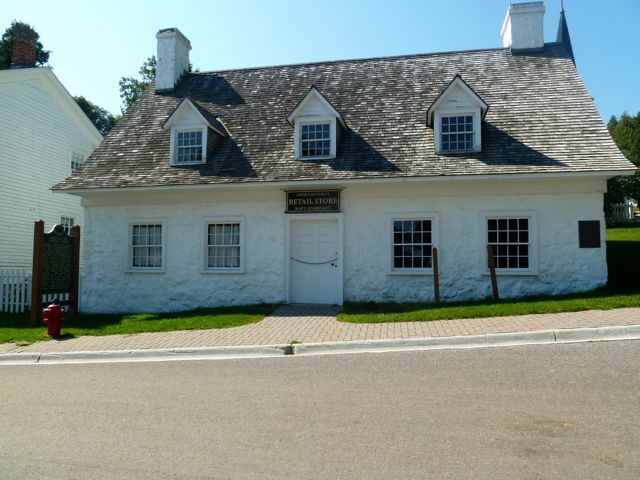 Fort Mackinac was founded during the American Revolution in 1780.The British moved the fort to Mackinac Island from Mackinaw City. 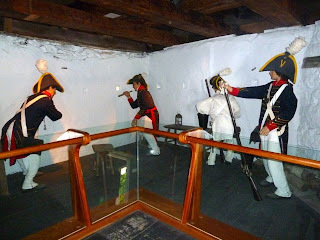 The Americans took control in 1796 and in 1812 the fort was captured by the British in the first land engagement of the 1812 War. 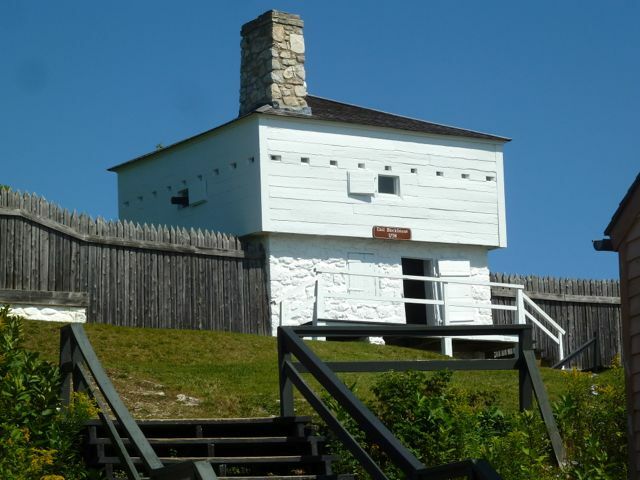 The Ghent Treaty returned the fort to the United States. The stone ramparts,South Sally Port and Officer's Stone Quarters are all part of the original fort built over 225 years ago. The other buildings are of the period 1790 to 1885. 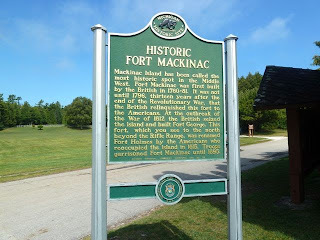 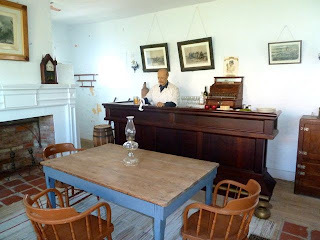 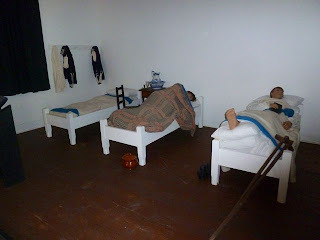 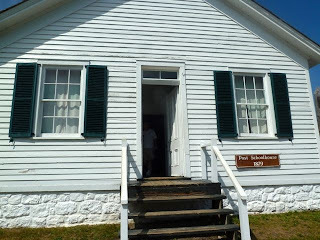 In 1895 the fort was abandoned and Mackinac Island State Park was created and the restoration was begun in 1958. The tour of the fort is self guided if you wish. 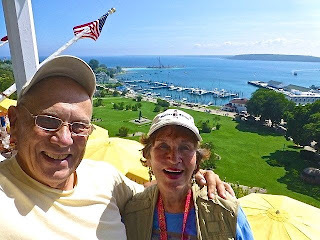 After touring the Fort we had lunch at the Tea Room Restaurant in front of the Officers' Stone Quarters with a beautiful view of the town and lake. It would be nice to spend a week on the island to partake in the many different ways of touring the island.